Bringing home a new puppy and teaching it where to go potty can be challenging unless you are mentally prepared and able to devote time to the process. Puppies generally eat three times a day until they have grown into adult dogs, which eat twice daily. It is best to feed your puppy at the same time each day and limit treats so that it does not need to relieve itself at all different times during the day and night. When disciplining your puppy for accidents, keep in mind that you must be patient and kind. Devote ample time for training your puppy on where to relieve itself. If you are using puppy pads, then place them in the same spot each time you change them. As the puppy goes on the pad, praise the puppy. Do not punish the puppy if you find a mess on the floor but didn't actually see your puppy in action. The puppy will not understand why you are angry. Do not rub its nose in pee or poop; it will not understand. If you catch the puppy in the act of going in an inappropriate place, say "No" and take it outside. Praise your puppy when it does go potty in the correct place. Try to get outside in time so that the puppy learns that outdoors is where it should go. After the puppy relieves itself, praise it, reward it with a treat and bring it back inside so that it knows the only purpose of going outside that particular time was to go potty. Consider crate-training your puppy, because it will generally not relieve itself on or around its bedding area. 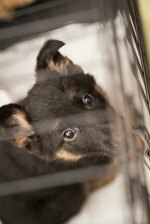 You cannot leave the puppy for hours inside a crate, but with increasing increments of time, your puppy will learn to hold its bladder for longer periods. Supervise your puppy at all times if this is possible. If you work outside the home, consider taking off a week to train your puppy. This may shorten the training period and will definitely increase your bond with the puppy. It will also make you and your puppy less stressed as you concentrate on your training efforts and it learns more about its new home and environment.